Fur: Blackish, that on mid-back with silver tipped hairs giving a frosted appearance;hair-blackish base, silvery tip. Tail membrane: Blackish; basal one-half furred. Wing membrane: Blackish, naked. Calcar: Not keeled. Ears: Short (15 mm), rounded and naked. Tragus: Less than one-half ear length; blunt tip curved forward. Total length: 90-115 mm. Forearm: 37-44 mm. Wingspan: 270-310 mm. Total weight: 8.5-12.5 g.
Dental formula: 36 total; I 2/3, C 1/1, P 2/3, M 3/3. Hoary bat (L. cinereus): Larger size (>20 g) and forearm (>46 mm); whitish hair patches on ears, elbow and wrist; furred dorsal tail membrane, feet and ears; teeth Incisors 1/3. Overall: Most areas from Alaska and southern Canada to southern United States. Iowa: Females found statewide in summer; males known only during migration. 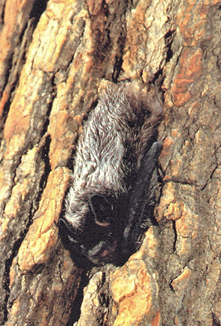 In summer, the silver-haired bat resides in woodlands, often adjacent to waterways and ponds. 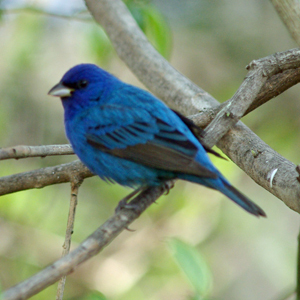 Although loose bark and tree cavities are used as nursery sites, precise summer roosting data are scarce. Because of its forest roosting habit, the silver-haired bat is difficult to see and is rarely encountered by humans. 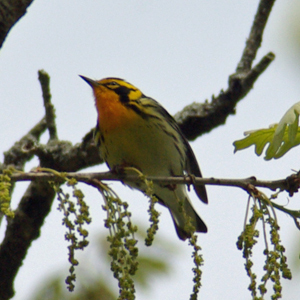 During spring and fall migration, there is some population build-up as males moving through the state join females and young of the year. Migrants arrive in Iowa by early April and leave by early October. These bats are low, slow fliers that, like most bats in Iowa, have two activity peaks-early evening and early morning. During foraging, a variety of insects are captured (including moths, flies, termites, beetles, caddis flies), suggesting that this species is an opportunistic feeder. Although the silver-haired bat probably mates in fall, the sperm cells are stored by the female until spring. She usually gives birth to two young in June and July. In Iowa, lactating females have been reported in late June and flying young by mid-July. Since females may be found throughout the state in the summer, this species does not appear to be in immediate danger of decline. Because it is a forest dweller, continued destruction of wooded habitat (especially in central and southern Iowa) could have a detrimental effect upon its survival in the state.